The Transitional Craftsman style kitchen design featured here was originally created for our 'Grandview' sample plan. Its open design concept is revealed in the 360° Panoramic rendering of the kitchen and living space, below. Barn doors open onto an adjacent space with a raised ceiling that can be used for formal dining or an office. The kitchen itself features LED strip lights below the wall cabinets and under the kitchen island countertop and a seamless island countertop. 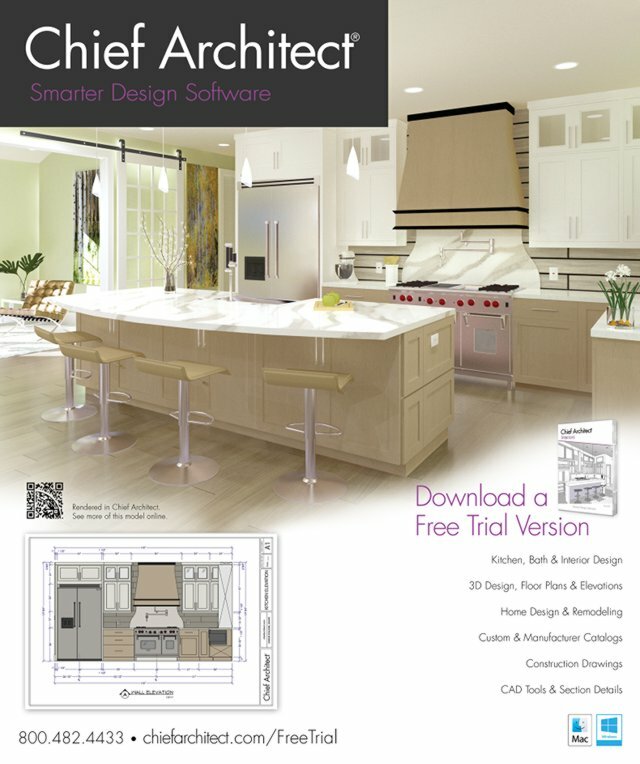 The Chief Architect® 3D Viewer model at the bottom of this page illustrates three material palette options for the cabinets, counters, and backsplash. Learn more about the Grandview home and download the full Grandview sample plan.